Nothing improves your appearance or boosts your confidence more than a bright, white smile! If your teeth have yellowed over the years, you can reverse the clock with a tooth whitening procedure. But what options are available, and which ones are the most effective at whitening your teeth? All toothpastes contain a mild abrasive, which helps them remove surface stains from your teeth. Whitening toothpaste contains an additional chemical such as carbamide peroxide or hydrogen peroxide to deliver additional effectiveness. Along with removing surface stains, these chemicals help to lighten the color deep within your teeth. Still, regularly using whitening toothpaste can only lighten your teeth by about one shade. Like other mouthwash products, whitening rinses freshen up your breath and reduce plaque that causes gum disease. As an added bonus, whitening rinses also include hydrogen peroxide or a similar product to whiten the teeth. Most manufacturers say 12 weeks of use is necessary before you see results. This isn’t surprising, since the whitening agent only has contact with your teeth for 60 seconds at a time twice a day. Expect only one shade of lightening when you use a whitening rinse regularly. Whitening strips are thin, flexible strips coated with peroxide-based tooth whitening gel. You apply the strips directly to the front and back of your teeth and must leave them in place for about 30 minutes for the peroxide to take effect. Apply new strips over the next few days according to the package directions until you begin to see the whitening take effect. Teeth usually whiten two to three shades with this method, and the results last for about four months. Whitening trays involve wearing a mouth guard-style appliance filled with a peroxide and bleach whitening gel. You can find these over-the-counter, which means you must boil the trays to form them to your teeth. The gel is equally as effective as whitening strip products, so you can expect to lighten your teeth by two to three shades with this method. Whitening trays are also available from your dentist. Evanson DDS offers BriteSmile® trays, which you fill with prescription-grade whitening gel for the most effective at-home treatment available today. The trays are custom-made for you at your office to ensure an accurate fit. It’s up to you how long you wear the trays. While you should keep them in for no longer than four hours while you’re awake, it’s safe to wear the trays overnight for faster, more convenient whitening. In all, treatment takes one to two weeks and your teeth whiten by as much as seven shades. You can maintain your bright, white smile by wearing the trays overnight once every one to three months. Evanson DDS also offers an in-office tooth whitening option from BriteSmile®. 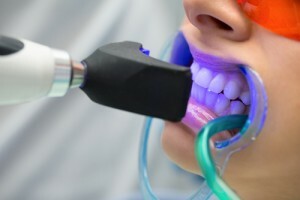 Treatment involves using a gentle hydrogen-peroxide gel solution activated by a special light to whiten your entire smile by an average of seven shades in a single one-hour sitting. The results are instant, but if you want to enhance and maintain your bright smile, you can use at-home trays following in-office whitening. Would you like a brighter smile? Over-the-counter options are cheap, but as with most things in life, you get what you pay for. Evanson DDS offers some of the best tooth whitening options available today from BriteSmile®. Our state-of-the-art office is outfitted with the right technology to deliver the results you’re hoping for. To schedule a free tooth whitening consultation, please contact us online or call our Parker office at (720) 409-0008 today.